The problem here is, that it is not possible to allow it for all future sessions. It is limited to the current client session, and will come up every time the user has restarted the client. This can be annoying for the end user. You might wonder what this has to do with running an external component. The reason is that a NAV Server instance that has an associated SPN is considered to be trustworthy, and therefore external components are safe to use. At the other hand, the client will not be able to contact to a server that has no associated SPN. That might not be a problem in live situations when every part of the installation and configuration is done correctly, including SPN’s. But when SPN’s are missing you will not be able to use this option. During installation a default ClientUserSettings.config is installed in the location ‘C:\ProgramData\Microsoft\Microsoft Dynamics NAV\70’. This config file is used as a default config for any user that starts the client for the first time. At first time starting, a copy of this config file is made to the location ‘C:\Users\<username>\AppData\Roaming\Microsoft\Microsoft Dynamics NAV\70’. If you want to configure the setting for all future users, then change the config file in the ProgramData folder. Otherwise change the config file in the Users Roaming folder. By the way and not on topic: for Terminal Servers / Citrix Servers it is a good idea to change the default config file in the ProgramData folder before any user starts the NAV client. That will save a lot of time. Great post! It was on my to-do list for a while to blog about this, because for some things I’ve been working on this became quite a pain. I hope to get time to post about a workaround I came up with, which has some limitations, but doesn’t require you to work with SPNs. On another hand, I personally believe this setting to be a misdesign by Microsoft in solution of this problem. The primary reason why not allowing future sessions to benefit from your choice whether to trust a component or not is because of how .NET works – you declare a .NET variable by referencing an assembly and the version – both of which can be easily faked by a malicious developer who can later substitute your assembly with their own, which does whatever it might be that you don’t want to execute while thinking you are executing something else. Now – while trusting the server instance through SPN is a good thing, whoever wants to infect your assembly (or replace it altogether with their own) can still do so – because there is no guarantee that the assembly at the run-time will match the one at design time, except for the namespace and class structure to be the same. Therefore, this only gives an impression of better security, but keeps a large security hole still open for potential attacks. The only true solution to this issue would be to require strongly-signed assemblies, just as the client control add-ins do. Then, nobody can either tamper with, or substitute, your assemblies, and then a one-time-valid-for-the-future choice would be correct. You are definitely right: NAV should not trust an assembly because of the server having an SPN, but because of being signed. Luckily, NAV uses the public key token in the variable declaration. If available… Which makes it a choice of the developer to use it or not. En because NAV does not enforce the use of a signed assembly, it is still vulnerable, no matter if the server has an SPN or not. So the conclusion is that developers always should use a signed assembly. And it would even be better if NAV enforces the use of it or, alternatively, only offer the always allow option for signed assemblies. By the way: the software test in the CfMD process checks for external assemblies. If they are not strongly named and signed, then the CfMD test will fail. That’s a good step of course. Notice the =Spn at the end rather that =NoSpn. Once this line is in the config it’ll stop whining about the DotNET components (as long as the Spn is okay). Of course the easiest way to add that line is to use the ServicePrincipleNameRequired item you described. But once the “Hint” is there you can remove the requirement tag. Note that this only applies when the ClientServicesCredentialType is Windows. For the other ClientServicesCredentialTypes there no way to skip this message. 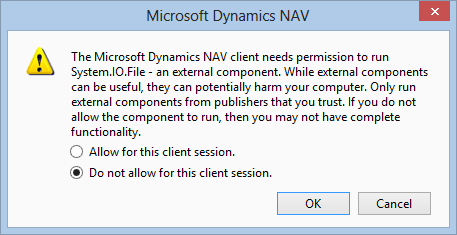 In NAV 2013 R2 there is nothing changed regarding this logic.